What about the alien abductions, man? And the probes, man, the probes! I accuse the EB team of hiding evidence about extraterrestrial activity in the Hellenistic period! But, what if the EB team isn't just hiding evidence but is using EB to distract us from the probing that's still on-going?!!? What if the EB team *is* the aliens? Seriously though, where's the Vimanas? Why don't EB have no Vimanas? We should able to recruit Social Justice Warriors. Generals become 'Triggered': -90% campaign map movement; Verbosity (long and boring pre-battle speeches); blue dyed hair. We demand testudos with mirrored shields so as to repel the alien thought rays! Ships should have an upgrade for ablative armor for their hulls because someone's gonna demand sharks with laser beams in their eyes. Well... 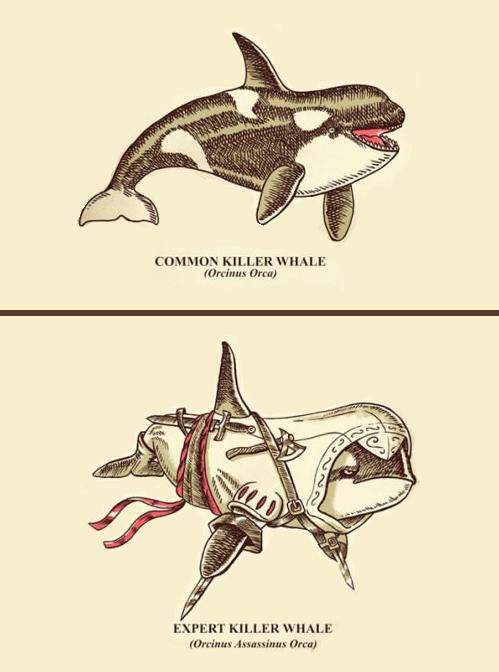 I prefer killer whales. Fish cannot be relied upon. When player controlled Carthage losses all overseas provinces a new event should fire with the name "Make Carthage Great Again" a new full stack army is spawned led by a charismatic general. The general becomes the new faction leader and control is handed over to the AI. Since the AI is dumb and cannot properly defend itself, it decides to build a YOOOGE sea wall cutting access to North Africa. The Parthian faction pays for the wall and the game ends with the following message: Carthage is great again, has many troops, the best troops, and wins lots of money, also wins so much that is already bored with winning believe me, its the best and the wall is so tall, really beautiful, trust me, I cannot describe how beautiful the wall is, and I know words, many words, trust me I got the best words. Trust me! Last edited by Ἀπολλόδοτος Α΄ ὁ Σω March 16, 2016 at 07:10 PM. Trolls have devolved into nothing more than annoyances on the internet, but back in the age of the mod, trolls were fearsome critters. Troll unit should have the power to cause enemy forces to rage quit and leave the battlefield. The unit looks like a light cav unit until it nears enemy. Then, all the sudden!!! it transforms into were-elephants! And, instead of having archers on their backs, they have an open topped water tank. In that water tank, is a shark, with laser beam eyes!! So, you guys don't like my suggestion, well I guess it was a... horrible suggestion. With the final release of EB2, a bottle of early Republic Era Roman vintage wine to be faxed to each downloading IP. ​"No one expects the Celtiberian Inquisition!" You're right...no one has ever expected that ever. CALL TO ARMS, BANNERS FLY IN THE WIND! FOR THE GLORY OF HELLAS! Last edited by Roma_Victrix; March 27, 2016 at 08:15 AM. Orcs can't stand against Triplex Acies. Zombies will fall to the Macedonian phalanx. Actually that's a pretty good idea, maybe I'll make a "fantasy monsters" submod for EB 2 someday. IGdood's Mercenary Unit Packs: http://www.twcenter.net/forums/showt...-Pack-Released! Europa Barbarorum Warhammer 40k 2! (the ! is part of the official mod name). The Father (Rad), the Son (Grimmy), and the Holy Spirit (Roma_Victrix), amen. You know what this game could use? Those Apocalyptic biker gangs from the Mad Max series. That should spice things up a bit. Somewhere, a history nut is biting his nails in fear that the team might actually listen to some of the stuff that gets posted here.